1:44 I expect another wave of buying to come in between 2:00 and 2:30; after 2:30 may get a short covering rally. 12:12 on the Chaos Clinic chart XTide line, note the rallies that match the price rallies. Says another one coming up. 11:20 if the red swan wins the crossover battle, I'll be stopped out for a decent gain. 11:16 on the Choas Clinic chart we have a red swan influencing this congestion. It crosses ove with a green swan almost exactly at the next trade time. That could pick up the green +Tide energy and run prices up the green swan line. 11:09 If we hold up until the 12:16 trade time, I think a second wave of buying will come in. This is based on my use of an indicator from my Chaos Trading Made Easy course and the homework I did using the guidance from that course. if you can trade multiple contracts, you could cover one and let the rest ride. 10:09 markets have two states: normal and chaotic. The hotline trades work well on most days because they are normal. I anticipated a normal dull Friday before the outcry session. I was aware of the Fractal grid setup, so I was ready to do a normal trade as per the normal hotline rules. But when I saw the velocity of the move, I realized my Fractal Grid pattern had worked and the marke had switche from normal to chaotic. 10:01 I have updated my chart in the CCT Room. It tells me to stay long into next week. So I will just trail a stop and let this one run. 9:58 The secret to making money in trading is understanding how markets work and having good tools. That's what my courses provide. They really are unique and do give you an edge. 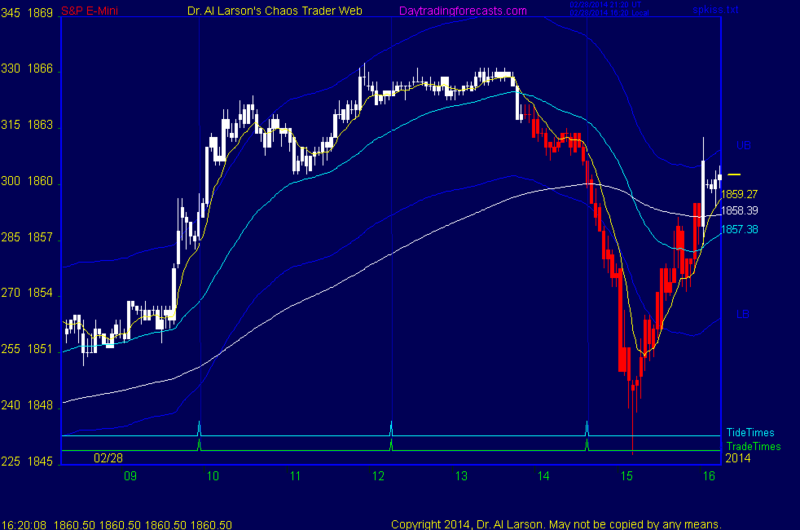 9:53 the Fractal Grid tool comes from my Chaos Trading Made Easy course. I use the emylar overlay version of it on an hourly 24 hour NinjaTrader chart ot help me fit today's pattern into a context. 9:50 stop up to 1854; lock a small profit so I can ride a free trade. 9:48 I was ready for that move inpart because I did my homework. 9:18 overnight trading has support at 1849 and resistance at 1855.75. Low near 7 AM was on red -Tide. It shows a low at first trade time, so I'll look for a possible long trade. Also have a green swan in the morning.